Have you ever wondered how we collaborate on projects when our team is scattered all over the globe? At MakeUseOf, we use an online project management platform to track progress, assign tasks, maintain discussions and stay on deadline. It’s especially important for us, since we don’t work in a physical office, to have an overview of each team member’s tasks from a central location. Today, we’ll look at Bitrix24, a cloud service that will allow you to create a social intranet for your company within minutes. Bitrix24 provides the tools to interact with your fellow colleagues, assign and manage tasks, assign tasks, share files, collaborate on projects together, and in doing so, glue the entire company together. We’ll be giving away 25 Startup accounts (anexclusive, customised plan), each valued at $1200/year for a total giveaway value of $30,000! Plus, we’ll also be giving away a 16GB Slate iPhone 5 to commemorate the launch of their new mobile application. More information about the giveaway after the review. In fact, go ahead and sign up for the free Basic plan to get started right away. Extranet, time management, meetings and reports features won’t be available; but it’s certainly good enough to go on, and is perfect for small teams. After the first year, winners may elect to either revert to the free Basic plan, or subscribe to any premium plan with a 50% lifetime discount. The Activity Stream is the first point of contact after signing in. It’s essentially a feed of everything that’s going on with the company i.e. conversations, new shared files, new projects, etc. Think of the Activity Stream as the virtual “water cooler” where colleagues chat and share news. The Activity Stream can get easily quite noisy during crunchtime, and if that ever happens, filter the stream to only view tasks essential to your workflow, or updates from a particular employee. On the left hand side, jump straight into work mode and easily create new tasks, calendar events, start a new conversation or upload new files with the Create button. Bitrix24 includes a convenient time recording tool right at the top of the page, where employees who are paid hourly wages will be able to clock in and out, and describe the tasks they’ve been working on. Moving on to the core function of Bitrix24 — task management. As a team leader, assigning tasks to the right people, setting appropriate deadlines and reminders are vital to making sure jobs gets done. Creating and assigning tasks is quite a streamlined process with lots of optional features. Bitrix24 allows administrators and team leaders to set the priority of the task, assign a deadline, add tags for searchability, and can even require their approval before the task can be marked as done. Reminders can be sent out via on-site instant message or email; and multiple reminders can be scheduled if the task is urgent. The default task list only displays those assigned to the logged in user, along with other pertinent information such as deadlines and the person who created the task. In addition to that, by using the filters on the right hand side of the page, team leaders may view tasks they’ve created for others, or all of the tasks in general. 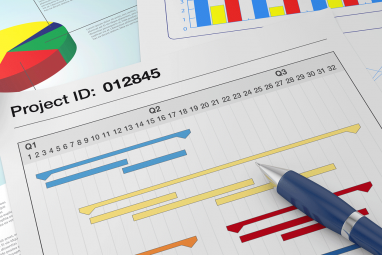 The Gantt chart view enables any administrator to obtain an overview of the current tasks, their progress and deadlines; again, an essential tool to ensure that everything is running smoothly. If you’ve noticed, we release several manuals every month, alongside giveaways, cheat sheets, and “Best Of” pages. How do we know when to schedule these events every month? Using calendars, of course! Bitrix24’s calendar is no different. It will allow any team member to easily schedule upcoming events, set reminders, list attendees, and colour-code them. It can also automatically schedule recurring events, send reminders for upcoming events, and assign CRM items for specific events (memorise those names before the meeting!). When working on projects that involve documents, images and other files; an invaluable tool to have at your disposable is convenient file sharing. Many companies would recommend using third party solutions purely because they don’t have the resources to host a file sharing service. However, Bitrix24 provides a secure online file sharing service which is really easy to use, and these files can be embedded right into relevant conversations or project files. Using the file manager, files can be arranged into appropriately named folders. 5GB of online storage is available with the Startup account, and individual file sizes must not exceed 300MB. Some file manages are pretty cumbersome to use, but not this one. It’s agile and very fluid. Bitrix24 provides both single and multiple file upload options. It also supports version histories for every file. And by using a supported browser (either Internet Explorer or Firefox), documents can be opened and edited directly in the browser. While this is happening, the file is locked so other employees won’t be able to access it or interfere with the editing process. The most impressive feature is definitely the ability to map any folder as a network drive. By doing so, users can instantly connect to their company’s file server and add or remove files conveniently, without accessing the web interface. Bitrix24 provides easy-to-follow instructions to set this up on every operating system. 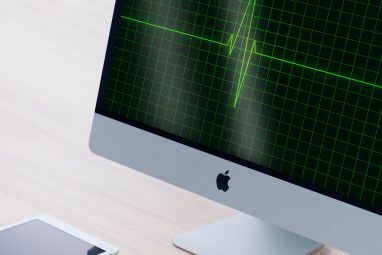 Connect to the file server using any suitable application, in this case, Mac OS X’s Finder. And the network drive will be mapped and available locally. The main reason for utilising a service like Bitrix24 is for its excellent project management tools. Projects or workgroups are essentially a team assigned for a specific goal. The project can host its own subset of tasks, calendars, conversations and files; so referencing them and gauging progress is much more streamlined. Team members, their progress and recent development are visible from the project overview page. Depending on the project, individual features can be enabled or disabled, and access can be restricted to group members only. Bitrix24 also provides the use of an Extranet, where external parties can be invited to join projects/workgroups and restricting their access to those projects. This feature is especially useful when the company requires assistance or collaboration from third parties, and provides a convenient platform for discussion and task tracking. Bitrix24 is a very comprehensive project management and social intranet suite. We won’t be able to review all of its features. If you’d like to learn more, browse through their feature list here, or sign up for a free Basic account to experience it for yourself. Overall, we’re quite impressed with Bitrix24. It’s comparable to the project management system we’re currently using for MakeUseOf, and in some aspects, it’s much better. To complement the web interface, Bitrix24 provides free mobile apps for both iOS and Android platforms. Their iOS app has just recently launched on the iTunes App Store, while the release of the Android app on Google Play is imminent. With these mobile apps, you’ll be able to manage your team and projects just as efficiently as you would using the web interface. To celebrate the launch of their iOS application, Bitrix24 and MakeUseOf are organising another iPhone 5 giveaway! We’ll be giving away a 16GB Slate iPhone 5 to just one lucky winner. To be in the running to win the iPhone 5 (as well as a year’s subscription to Bitrix24’s Startup plan), join the giveaway below. Read our review of the iPhone 5. 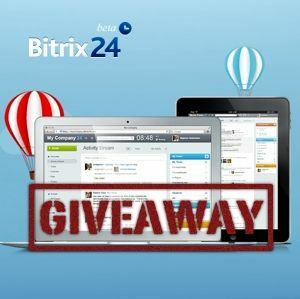 How do I win a free Bitrix24 account and the iPhone 5? And the iPhone 5 winner is Jonny Cullins! Congratulations! If you were selected as a winner, you would have received your license via email from jackson@makeuseof.com. If you require any assistance, please get in touch with jackson@makeuseof.com before Nov 25. Enquires beyond this date will not be entertained. Explore more about: Collaboration Tools, MakeUseOf Giveaway, Organization Software, Project Management, Task Management, Time Management. Yay, I won!. Thanks MakeUseOf! I'm one of the lucky winners of the bitrix24 standard memberships. Thank you, makeuseof! Unfortunately, I currently don't have a use for this wonderful service, so if there's anyone who might find this membership valuable (at an extremely discounted price, clearly), or knows anyone who might, please contact me at eleheart (at) gmail (dot) com. Congrats to all the rest of the winners! The winner is shown in the place where you entered your contact information on this page. It will change eventually and tell you who has won the contest once the winner has been selected. Wow. i'm so late in this giveaway. joining in the last day. :( Good luck! Bitrix + iphone 5(although i am not that much fan of iphone but still it is nice) = MUO rocks + wow-eee-wow!!!! This is a neat website! I'm just wondering, what happened to the other iPhone 5 giveaway? Entered, wow I hope I can win! hey do you know ......what happened to the iphone 5 giveaway???? i really wannna know about it. The service looks great. If I had a company, I would use it. Not sure what use I would get out of it though. I could use the free IPhone though. I wouldn't be able to afford one otherwise. Good luck to the winners!! Happy Halloween!!! I have been using Bitrix24 for over a month now and the features are very nice for a free product, but lately I have been encountering some very bad bugs with the calendar both in creating tasks and adding "calls or events" under the CRM. Tasks or calls will not show up on the right day no matter how many times I try to delete and re-add these events. Also, my tasks will shift from one day to the next in the middle of the day as opposed to 12:00am. Instant messaging also says "yesterday" when it is actually "today". And for as long as I've used Bitrix24 when you click on a date in a calendar to select it for your task the day before is selected. I know this is in beta but these date/time issues seem pretty serious for a time management/project management tool that already expects pro/enterprise users to pay for it. I've created a support ticket. Let's hope they fix this quickly. Bitrix24 seems to be a cloud service very functional. Normally I use dropbox or google drive to work and collaborate on different projects, but the Bitrix24 service seems a little more complete and with a lot more features (as well as payable service it is expected to be a better service). In short I think it is a service to try! Interesting:- will give this a try as we struggling with our current project management tool. Thanks for the in-depth look. nice stuff. keep 'em coming! ^_^ ? Thanks for this outstanding ! Please count me in the draw ! I like it very very much ! This is great idea giving a chance to those lucky winner who are wiki in this website. Winning one of these would make my year. Thanks. I keep using your great stuff. do i have points or not? am i entered in the iphone marvel? good stuff to get free. Done . Never lose hope in LOVE GIVEAWAY !! Thank you for the awesome giveaway I would love love love to win this !!!! Good luck to all. Very nice, good luck all. This is a great product that I can promote to my clients! Nicely done. Fantastic for collaboration and the pricing is super reasonable! Thanks!!!!!!! Great giveaway, want to win the iPhone 5 so bad!!!!!!!! For me? You shouldn't have! Seriously, want! When . . . . . huh ? Bitrix looks quite interesting. I'd love to use it for my downlines in my network marketing biz. iPhone 5 giveaway again? I really would love to clinch it this time. I sure would like to win an iPhone 5. This cloud certainly does alot more than other ones! I love MakeUseOf.... so many good reviews !!! Nice review but don't really need the Bitrix 24 as don't work due to disability so won't use it really. Entered for the iPhone 5 giveaway just might be lucky with one of these giveaways one day, antway GLA. Thanks for the opportunity to win this prize ! I need it badly for replacing that Samsung junk! seems to be great stuff...! I hope the god is with me this ..
Nice interface... might try this for our school PTO. Time to upgrade my iPhone 4! I'm sure I will find this useful to use and the iPhone is just gravy. love to win the iphone 5!!! Knowing about the software that is used in the "real" world gives me examples to show my students that collaboration is a skill they will really need once they are out of high school. As well as a refute to why they can't pick their own groups. Yeah common again for the givewawy..hope this time is me!!! This is definitely something productive! Omg. Bitrix would be perfect for my fantasy football league, but it seems to be best utilized for small companies and businesses. So I can implement it in my movie selling business, which will allow myself and my employees better interaction and communication within, resulting in increased productivity and efficiency, while also allowing me to fire someone as a status update. This is something that I could use for my startup. The functionality is very promising. Excellent! Thank you for sharing it and also for the giveaway! Looks interesting -- glad it works on Android as I don't have a IOS device (yet). Thanks, hope I win this time! Could this be it ...? The Bitrix24 system seems pretty neat, and of course an iPhone is always welcome to the game. Nice article! The great thing is that it's free for the teams of up to 12 people. Bitrix looks GREAT. I really need to look into using this. It would make my life so much easier when managing my team in different countries. I have seen services that are similar, but this seems much better. Does "Alternative entry method: Use your points!" can add the opportunity to get the rewards? I mean i ahe enter the giveaway with code, but there is also alternatives, do i need to use it too? I don't quite understand you, but I think so. OK, then I will also use the alternative one. I think he means Does using Points ,instead of the giveaway code, increases your chances of wining ? i think he wants to know if doing both will double his chances. Tested it and seems to be working, Loreson. Try refreshing your browser and report back. Login again works for me!